A new study details the waves of the epidemic. A new study details the destructive nature of opioids, reporting that the number of opioid-related deaths in the U.S. has more than quadrupled in the past 18 years. All told, there were 351,5630 people who died as a result of opioid-related deaths between 1999 and 2016, according to the study in JAMA Network Open. For context, that figure is just above the estimated population of Honolulu, Hawaii. The actual opioid-related death rate went up from 2.9 per 100,000 people in 1999 to 13.2 per 100,000 people in 2016, the report states. The study also concluded that while opioid-related deaths were previously viewed as being a problem largely in the Midwest and Appalachia, the issues have shifted toward the northeast in the past decade-and-a-half. The reason the opioid problem has become so bad, according to the report, is not because it has been one continuous epidemic, but because it has come in three waves. 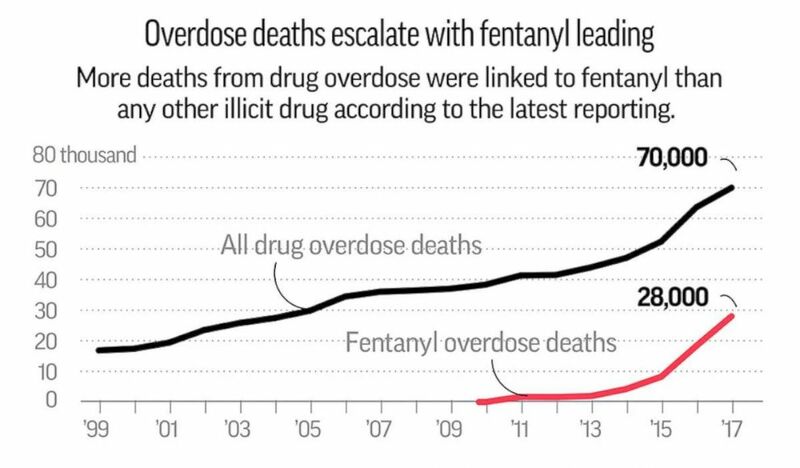 (AP) An Associated Press graphic made with data from the CDC compares Fentanyl overdose deaths with all drug overdose deaths. The first wave of the epidemic, the report states, was tied to the use and abuse of prescription painkillers from 1999 to 2010. At that point, the second wave, which started in 2010 and continues to the present, involved the increased use of heroin and subsequent heroin-related deaths. The final wave, which started in 2013, is tied to the increased use of what the study authors call illicitly manufactured synthetic opioids, including drugs like fentanyl. That description matches with the findings of earlier studies, such as a report from the Centers for Disease Control and Prevention published in December, which detailed an increasing rate of fentanyl deaths in recent years. 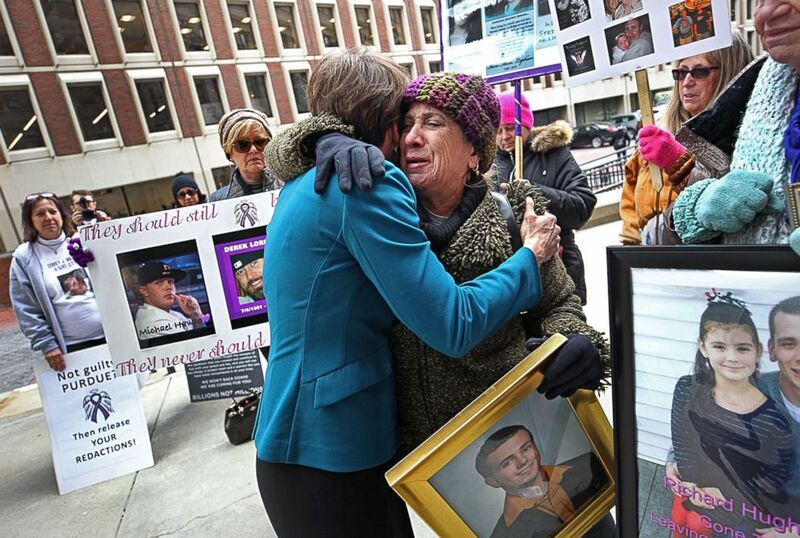 (Suzanne Kreiter/The Boston Globe via Getty Images) Attorney General Maura Healey hugs Paula Haddad, whose son Jordan died from opioids at the age of 26, as Healey entered the courthouse at Suffolk Superior Court in Boston for a status update on the Attorney General's suit against Purdue Pharma on Jan. 25, 2019. The shift in the impacted states comes as several states saw their opioid mortality rates increase multiple times. According to the current study, Washington D.C., saw the fastest increases in opioid-related mortality rates, more than tripling every year since 2013. In addition to D.C., there were two states — Florida and Pennslyvania — where opioid mortality rates doubled every two years, and eight states — Connecticut, Illinois, Indiana, Massachusetts, Maryland, Maine, New Hampshire and Ohio — where it doubled every three years.